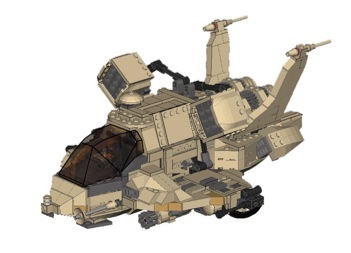 The CSR-001 manual contains a 76 page step by step guide to building the modern recon craft from your own bricks. Cockpit seats two figures, Retractable landing gear x3, and opening crew door. Lots of interior lights, computers, console with seat and jump seat. 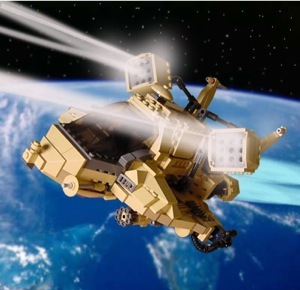 The Strike version carries dual topside rocket packs, side mounted cannons with bottom gun feeds, bottom rocket pods, missiles and working bombay doors with bombs that really drop. 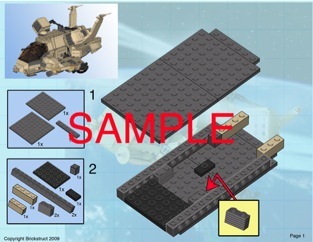 CD also contains a complete parts list you will need, and a photo sneak of the Hangar bay that’s next.